Still not convinced by the Libertalia Collector's Edition or just too pricey for you? It's great to have options! NECA has revealed that they will be releasing a 7"inch Nathan Drake figure based on his look from the Uncharted 4 game. "This 7” scale action figure features almost 30 points of articulation and is packed with fortune-hunting accessories: coiled and uncoiled climbing ropes, pistol, AK-47, two sets of hands, and two interchangeable head sculpts. Comes in collector-friendly deluxe window box packaging with opening flap." 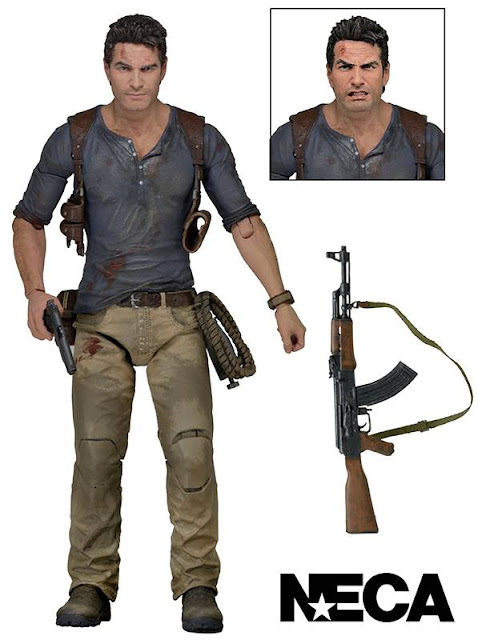 Releasing some time in May 2016, this will be a nice addition to any Uncharted collection..